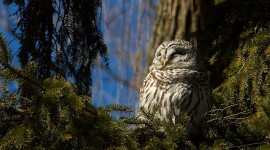 A barred owl basks in the sun at the base of the Algonquin Island bridge, one of those Island where-were-you-when moments. 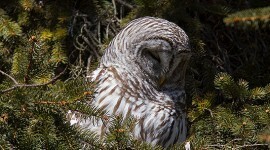 A barred owl glances downward as a Parks Gator drives by, the most concern it showed for hours as it snoozed in a tree on Algonquin. 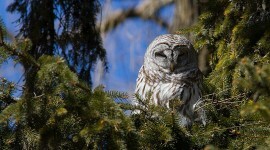 A barred owl perches in a fir tree at the base of the Algonquin Island bridge, completely unconcerned by the crowd gathered below. 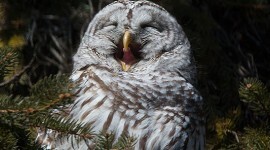 A barred owl interrupts a snooze in the sun to yawn loudly. Well, as loud as an owl ever is, which is virtually silent.